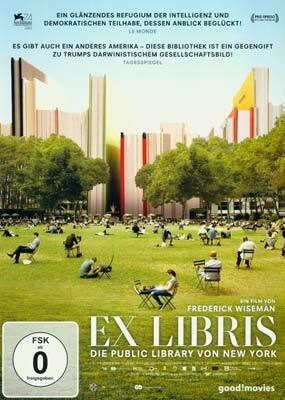 Ex Libris: The New York Public Library (tysk omslag) (DVD) - Laserdisken.dk - salg af DVD og Blu-ray film. Frederick Wiseman's film, Ex Libris: The New York Public Library, goes behind the scenes of one of the greatest knowledge institutions in the world and reveals it as a place of welcome, cultural exchange and learning. With 92 branches throughout Manhattan, the Bronx and Staten Island, the library is committed to being a resource for all the inhabitants of this multifaceted and cosmopolitan city, and beyond. The New York Public Library exemplifies the deeply rooted American belief in the individual's right to know and be informed. It is one of the most democratic institutions in America – everyone is welcome. The Library strives to inspire learning, advance knowledge and strengthen communities.